over whether I am going to cease to do business with him, I have to ask myself some questions. Am I angry with him? Did his actions place any direct strains on me or my life? Will continuing to do business with him say something about me and my integrity? Would I have done what he did under any circumstances? All of these questions and more are swimming through my head at this very moment. These are the moments that are truly magic in my opinion. The moments that challenge who we are and how we process things when the house of cards fall around us. In this case, because we live in a time that any information from any part of the world can go viral in seconds, we also can jump on the band wagon in a very rapid fashion without knowing all of the facts. The down side is that video has become so powerful that the old saying "seeing is believing", is stronger than ever. So now I will share this short story with you in a very concise way. 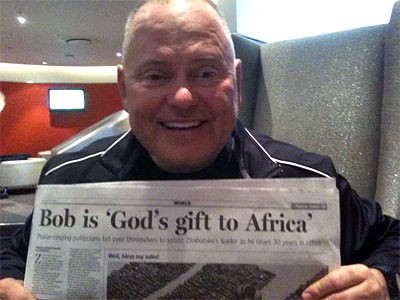 Bob Parsons, the founder and CEO of the popular hosting company GoDaddy.com was on a little excursion in Zimbabwe and was told that the elephants had been destroying crops by stampeding through a certain area at night. He waited in the dark in silence with the other villagers and took 4 shots at the elephants when they appeared, shooting one big elephant in particular. The next morning, hundreds of hungry villagers arrived to get a piece of the elephant meat and Mr. Parsons is now regarded as a hero in Zimbabwe for killing this seemingly destructive elephant and providing some food for hungry people. If a mosquito is bothering you, do you kill it? If you protect yourself with netting or the like, are you being cruel by preventing it from feeding? This topic has a lot of legs in my opinion. Each side has their position and it is turning into a huge ball of negative energy. So now people are taking their business elsewhere and in a sense working as hard as they can to make him hurt because of what they personally do not agree with in their heart. So the question is, do we get ahead in life by repeating the same behavior that angers us in the opposite direction? In one way it seems as though this whole thing could have been handled in several other ways. On the other hand, now that it has been done, we could also just send him strength and positive energy in hopes that he will not repeat this action ever again. Where do you stand on this topic?